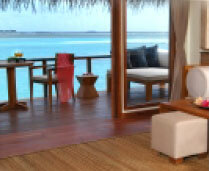 36 over-water bungalows with contemporary decor, coral garden, private sun lounge with direct access in to the lagoon. 14 superior over-water bungalows with contempary decor, horizon edged bath tub, private su lounge and seperate day bed area with direct access in to the lagoon. 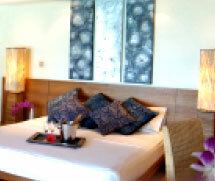 Dhoni Bar: 25 meter horizon edged swimming pool sorrounded by sun decks and relaxation champas. Enjoy a snack or relax with afternoon tea. Bar open from 10.00 a.m until 12.00 p.m daily.